There was once a community of frogs living in a well near the Atlantic Ocean. None of them had ever been out of the well, so they knew nothing of the outside world. Then one day a particularly athletic young frog managed to leap out of the well. He began to explore. When he came to the beach and saw the ocean, he was astonished. He’d never seen anything like it, and he rushed back to the well to report his discovery. Back in the well, the young frog excitedly asked to see the most learned frog in the community. This senior frog knew all there was to know about the sociology, history, and geography of the world-in-a-well. He was a veritable repository of froggish knowledge. Let’s call him Dr. Frog. “I saw a vast body of water,” replied the young frog. “How vast? Was it twice the size of our well?” And Dr. Frog puffed himself up a little in appreciation of such a huge body of water. “Was it four times the size of our well?” Dr. Frog puffed himself up some more. “Ten times the size of our well?” Dr. Frog puffed prodigiously. 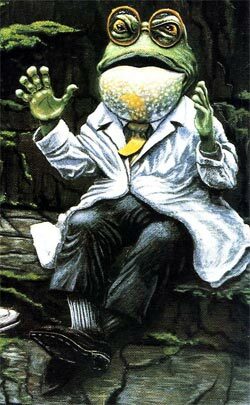 “No, no, you don’t understand.” And with that Dr. Frog puffed himself up a little more—and burst. His Divine Grace A.C. Bhaktivedanta Swami Prabhupada, the founder and spiritual guide of the Hare Krishna movement, would sometimes tell this story to illustrate the limitations of the scientific method when applied to ultimate questions such as the origin of the universe or the existence and nature of God. Srila Prabhupada’s criticism of material knowledge echoes that found in the Vedic literature, India’s large body of philosophical writings. Thousands of years ago the Vedic sages analyzed the reasons why knowledge acquired through the material senses and mind is defective. First of all, the senses themselves are limited and imperfect. Second, we easily become illusioned. Third, we make mistakes. And fourth, we have a tendency to cheat, to claim possession of the truth when the foundations of our knowledge are shaky. Let’s take a closer look at these impediments to materially acquired knowledge. The first problem we face when trying to get accurate information about the external world is that our senses have physiological limits, or “thresholds of perception.” Take the eyes, for example. We can see only a tiny fraction of the total electromagnetic spectrum. An electromagnetic wave can range from one quadril-lionth of a meter up to 100 million meters in length. And of this immense array of energy, we can see only the waves between 400 and 750 millimicrons long. (A millimicron is a billionth of a meter.) Violet falls around the 400 millimicron range, blue around 450, green around 500, yellow around 600, and red around 700. Anything outside this thin band is invisible to us. Our hearing is limited in the same way. Sound waves are measured in hertz, or cycles per second. Human hearing extends from 20 hertz up to 20,000 hertz. We’re deaf to any vibration above or below this range. If we examine each of our remaining senses, we’ll find them similarly limited. So even if amplified or refined by instruments, whatever knowledge we base on sense perception is no more perfect than our imperfect senses. Psychologists and other students of perception have done much research into illusion, particularly in the realm of vision. The sense of touch is also highly susceptible to illusion. If our hand has been warmed sufficiently, “warm” water will feel cool. If the hand has been cooled, “cool” water will feel warm. This phenomenon leads to situations in which we can perceive the same water as simultaneously cool and warm! If we taste an orange after tasting sugar, the orange tastes sour. But after a lemon, an orange tastes sweet. Auditory illusions are also common, as the art of ventriloquism clearly demonstrates. Clearly, with our imperfect senses and our illusion-prone mind, mistakes are inevitable. To err is human, the saying goes, but unfortunately humans sometimes go beyond innocent error and deliberately propagate untruths. Scientists are not immune to this shortcoming. For many years, textbooks on evolution routinely cited the Piltdown Man as evidence that human beings have descended from an apelike ancestor. In 1912, archeologists excavated a humanlike skull and an apelike jaw from a gravel pit at Piltdown, in the British Isles. The bones were deemed parts of the same creature, which was duly reconstructed in full and placed in the British Museum as an example of a transitional phase between ancient ape and modern man. In 1953, however, investigators discovered that the jawbone of the Piltdown Man was actually of very recent origin and had simply been stained to look like a fossil. In addition, someone had filed the teeth down to change their appearance. In other words, the Piltdown Man was a fraud, apparently engineered by one of the original discoverers. Taking all this into consideration, we should be highly doubtful about the picture of the universe given us by natural science, what to speak of its ideas about ultimate questions like the origin of life and the existence of God. Does this mean, however, that we can never hope for answers to such questions? No, but it does mean that we have to find another method of getting them. According to the Vedic literature, the way to receive perfect knowledge about such ultimate questions is called the avaroha-pantha, the descending path of knowledge. It stands in contrast to the ascending path of material science, the method of speculative research with the imperfect mind and senses. As we have seen, this ascending path can never lead to certain knowledge. But on the descending path, we accept knowledge from a perfect source, one beyond the four defects. Only in this way can we circumvent these impediments and attain knowledge of God. Consider the predicament of a man who doesn’t know who his father is because the father left home before he was born. How can the son know his father’s identity for sure? One alternative would be for the son to personally interview millions of men—obviously a tedious and most likely fruitless endeavor. This is the ascending path of knowledge. Another alternative is for the man to approach his mother and ask her who his father is. This method, the only method with any hope of certainty, is the descending path of knowledge. The problem, of course, is finding a source of perfect knowledge—a source not subject to the four defects outlined above. Such a source is especially needed when we are searching for answers to questions about the origin of life and matter or the existence and nature of God—in other words, the Absolute Truth. Devotees of Lord Krishna recognize the Vedic literature as the primary source of perfect knowledge about the Absolute Truth. Admittedly, a certain amount of faith is needed to embark on the process of realizing the truth contained in the Vedic knowledge, a process known as bhakti-yoga, or devotional service. But this faith is no different from the faith a freshman in a college chemistry course must have to begin his studies. He can’t be sure that the experiments will work or that the information in the textbooks is accurate (indeed, as we have seen, some of it probably isn’t), but he has faith in his professor, an expert in chemistry, and in all those who have gone before him, completed the course, and confirmed to their own satisfaction that the corpus of standard knowledge is true. Similarly, when someone takes up devotional service, he comes under the tutelage of a spiritual master, an expert in devotional service who teaches the knowledge contained in the Vedic literature and who has personally realized the Absolute Truth. The neophyte devotee also meets others who are further on in the course of bhakti-yoga and who have realized the Absolute Truth to some extent. And he himself begins to realize transcendental knowledge as he continues serving the Lord. So the knowledge derived from the practice of bhakti- yoga, though outside the purview of the material senses and mind, is as scientific—or more so—than what we commonly accept as scientific fact. The Vedic literature tells us that perfect knowledge originates with the Supreme Personality of Godhead, who is the creator and controller of the entire material manifestation. If we wish to understand the ultimate meaning of a painting, we should approach the artist who painted it. He’s the best source of knowledge about his own creation. Similarly, the Supreme Lord is the best source of knowledge about the universe. He is not hampered by the defects of ordinary human beings. His senses are perfect and unlimited, and He is completely free from the propensity to become illusioned, make mistakes, and cheat. At the beginning of creation, Lord Krishna spoke the perfect Vedic knowledge to Brahma, the first created being in the universe. Brahma then repeated the same perfect knowledge to his son and disciple Narada. Narada in turn spoke it to the sage Vyasa, who repeated it to his son and disciple Sukadeva Gosvami. And in the same way the Vedic knowledge has come down to the present day through a chain of disciplic succession. At a certain point, the Vedic teachings were committed to writing. The most essential Vedic texts, such as Bhagavad-gita, contain the direct words of the Supreme Personality of Godhead. In contrast to other scriptures, which give only the most rudimentary accounts of creation, the Vedic literature gives detailed accounts of the origin of the cosmic manifestation, from the atom to the varieties of planetary systems. So by accepting the transcendental knowledge that comes down through the chain of pure devotees of Krishna, one can rise above the defects of the material mind and senses and reach a scientific understanding of the Absolute Truth. The alternative is Dr. Frog’s philosophy—which is ultimately a bust.